Love the beneath the sea theme-fish are great!!! Nice page all around! Thanks for joining in again at THE MEMORY NEST!!! 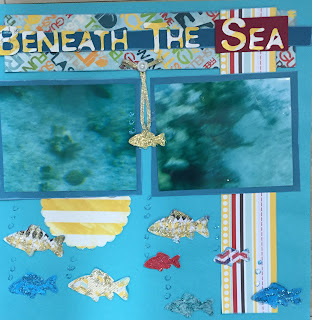 Super colours for your sea themed page. Love all the little fish swimming around. Thanks for using the sketch from The Memory Nest. This is a great layout! I love the fish and the colors are perfect. Thanks so much for joining us at The Memory Nest! This is so cool!! Feels like being under the sea!! Thanks for playing along with tMN! !